this is Bernhard from Vienna with a new edition of the monthly newsletter Tango-DJ.at about DJ-ing, special tango CDs, tango dancing and much more. If the newsletter is not displayed correctly you might consider reading the online version. Enjoy! Review of the 15 CDs set "Tango An Anthology"
There is the lovely regular Thursday milonga beforehand, on Friday you may choose out of various local milongas, the big saturday night birthday milonga lasting for up to 12 hours and a Sunday afternoon milonga afterwards. No registration necessary, just come and enjoy! This one I want to point out especially because they managed to invite Julio Balmaceda who does not work too often in Europe..
After an inquiry for the correct recording dates of early recordings by Orquesta Edgardo Donato as stated on various tracklistings (e.g. BATC CD ORQ-275) and on my CD-discography of Edgardo Donato and various other websites, I started to do some research on this. There is quite a confusion going on with some of the early recordings of Orquesta Edgardo Donato as far as the recording year is concerned. Let's take "Buena yunta" as an example of this. You can find it on the BATC CD Edgardo Donato 1931-1932 - BATC (orq 275). The title of this CD suggests a recording year of 1931 or 1932. But you may also find it on a compilation of an argentine collector with the title Edgardo Donato - Sello Brunswick - Vol. 01 (1929) - CdT. On it's backcover you will find the catalog number 1026 and the year 1929. This conforms to the date given in the discography of Nicolás Lefcovich as well as the discography on tangodj.org. 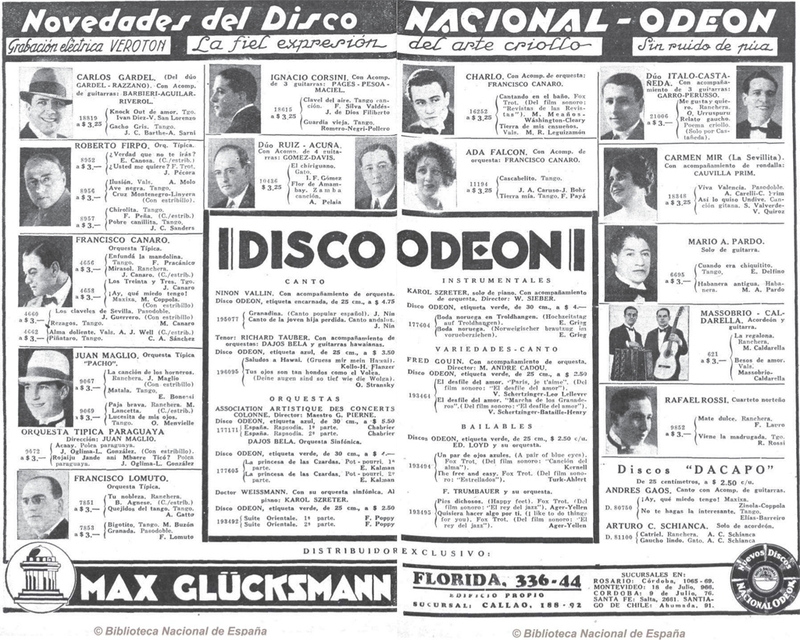 But you may also find the publication of Brunswick announcing its new record including the recording of "Buena yunta" with catalog number 1026 on 14th of June 1930 in Caras y Caretas. You can take a look at this publication online using the Hemeroteca Digital (digital archive) of the National Library of Spain. The announcement of Brunswick in question was published on page 45 of Caras y Caretas N° 1654 on 14th of June 1930. 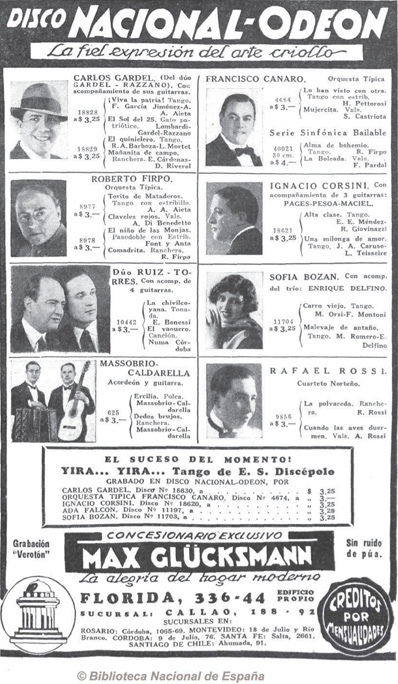 You can also find the annoucement of a record with the catalog number 1020 including "Cardura" and "No mires p'atrás" performed by Orquesta Donato-Zerrillo in Caras y Caretas N° 1644 of 5th of April 1930 on page 55. This means that all recordings with catalog numbers higher than 1020 have been published in 1930 or later. I therefore changed all years of recordings of Orquesta Edgardo Donato from 1929 to 1930. This conforms also with the information given on todotango that Donato performed until 1930 as "Orquesta Típica criolla Donato-Zerrillo". I was pointed to this amazing source of information by Christoph Lanner while discussing this issue. Thank you very much for your help and this hint! In case you did not come across his amazing Francisco Canaro discography - check it out! I try to keep a reasonable selection of CTA-CDs in stock. One of each group of the most important orchestras and CDs of special interest. At least one soundsample per CD has been added to all of these CTA-CDs I keep in stock. Please take a look, or better listen to this outstanding recordings on my page for CTA-CDs in stock. Again some new AMP CDs have been added to the AMP-cataloge. There is a soundsample of almost all of them available. I also try to stock a small selection of AMP-CDs. For now this will be CD-1257R, CD-1247, CD-1264M and CD-1281. This is a 15 CDs set published by Sony. This set was promoted a lot and recommended by plenty of people for good value for money. Indeed this set might be tempting for everybody looking for "cheap CDs". Well, you get lots of CDs for little money, that's for sure. You will find this set of 15 CDs for about 24,- EUR. I reviewed the first 9 CDs and corrected and completed the tagging information which you can find on my page for various labels. (A lot of details were missing) This set is cheap and the selection is the same. 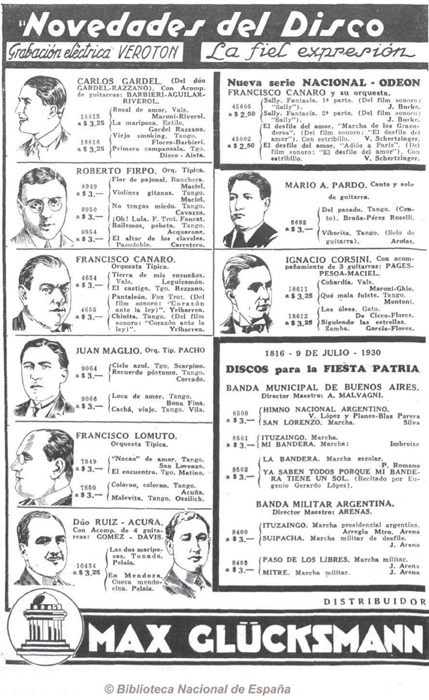 It is not at all what it likes to be - a selection of important tangos of different periods of the tango history. For the 1940s you get three recordings of Carlos Di Sarli, but plenty of Alfredo Gobbi, Francini-Pontier, Osmar Maderna, Hugo Del Carril - so you get the idea? I stopped reviewing and correcting with CD 9 because CD 10 to 15 cover the years from 1960 starting with Quinteto Real till today with María Graña, Lidia Borda, Soledad Villamil and Gabriela Torres on CD 15. I got the impression it is rather a selection of the cheapest tangos available. At least there is some basic information about the tango decades and interprets given in the booklets. So if you look for cheap music go on, but I doubt you will be happy with a selection like this. All CDs which can be ordered at tango-dj.at of following catalogues are linked with the corresponding entries at tango.info. So in case you want to refer to a certain CD on my website within the given catalogues you are able to link directly to this CD now! Previous newsletters can be found in the newsletter archive. Thank you very much for your attention. I'd very much appreciate your feedback and comments on the content presented. In case you know somebody who might be interested in this newsletter please recommend it or place a link to Tango-DJ.at.